Craziness is in the air! Launch of high-end categories – Planes and Experience Rides & Rentals at Droom has created a lot of ripples in the online automobile marketplace. With this droom.in has made it easier for everyone to realize their dream of flying in a private jet. We all love living a king size life, so grab your chance to experience the luxury of a lifetime. Droom is spreading happiness by running multiple contests on its newly launched categories. You can checkout various contests going on at different social sites including Facebook and Twitter. You can like, share, and comment on our facebook posts to participate in the contest. 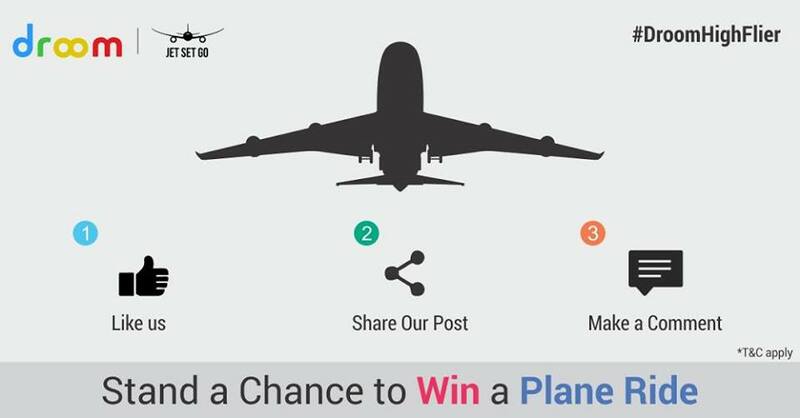 You can even go to droom.in and register yourself on our website to get your chance to win a free plane ride. Also you can download droom mobile app for Android and iOS users and register on it to stand your chance to experience a mind-blowing plane ride. These contests are valid for a limited time only, and a lucky winner from each contest will be liable to fly through the clouds. Check more about the contests with #DroomHighFlier. Also save 5% on experience rides and rentals with introductory offer code FUN5. Quickly make your way to Droom and get ready to fly.